Fried. Chicken. We all love it. Even vegetarians crave it! But traditional fried chicken from KFC, and chicken tenders from Arby's and McDonalds are NOT part of an optimal diet. Even homemade, most recipes call for flour and bread crumbs. So what are we to do when we get a hankerin' for this classic American favorite? Well, we reach for the coconut flour, that's what we do! 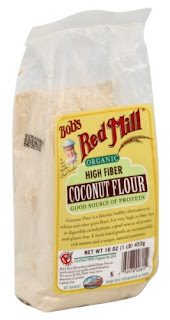 What is coconut flour, you ask? Simple, it is ground up coconut. It's only one ingredient, that's it! The best part, it's loaded with dietary fiber, protein and even a bit of iron. Obviously, it's also 100% gluten free, all natural. 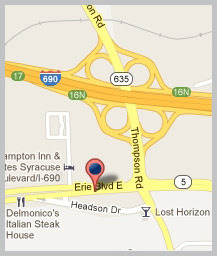 You can find it with the rest of Bob's Red Mill products, which are sometimes in the health foods section or the baking aisle of the grocery store. Wegmans has it! 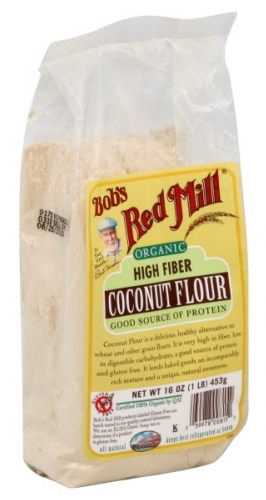 There are other brands out there, but Bob's Red Mill seems to be the most popular. I would like to point out ahead of time that if you coat the chicken with the egg/coconut flour mixture and refrigerate for at least 5 hours before cooking, the batter tends to stick to the chicken better while it is cooking. *Do this only if you plan to cook the chicken right away* --> Pour oil into frying pan on medium heat, so it's about an inch high in the pan. Heat oil while preparing the chicken, about 5 minutes. Dip chicken pieces into the coconut flour mixture, then dip into the egg mixture, then dip back into the coconut flour, coating both sides. Sauté in oil for about ten minutes, but flipping every couple of minutes to cook evenly. Chicken is done when the coating is brown and crispy. Cut into the largest piece to make sure it cooked all the way through. Outside should resemble that of chicken coated in breading and taste very similar as well! Surprisingly you will not have any coconut taste either. This recipe is awesome and it is one of our household favorites! Chicken Breast with Rib Meat (Containing up to 20% of a Solution of Water, Celery Salt [Salt, Celery Seed], Sodium Phosphate, Salt), Bleached Wheat Flour, Water, Contains Less than 2 % of the Following: Salt, Spice, Partially Hydrogenated Soybean/Cottonseed Oil, Natural Flavorings, Sugar, Dextrose, Soybean Oil, Yeast, Yellow Corn Flour, Leavening (Sodium Bicarbonate, Sodium Aluminum Phosphate), Monoglycerides, Oleoresin Annatto (Color), Oleoresin Paprika (Color), Prebrowned in Vegetable Oil. Chicken Breast with Rib Meat: water, modified potato starch, seasoning (salt, flavor, maltodextrin, modified corn starch, contains less than 2% of citric acid, disodium guanylate, disodium inosinate, chicken broth, partially hydrogenated soybean and cottonseed oil, soy sauce solids. [wheat, soybeans, salt], yeast extract), sodium phosphate. Chicken Breast with Rib Meat, Water, Seasoning (Maltodextrin, Salt, Sugar, Autolyzed Yeast Extract, Garlic Powder, Spices, Natural Flavors, Onion Powder, Modified Corn Starch, Chicken Fat, Chicken Powder, Chicken Broth, Disodium Guanylate and Disodium Inosinate, Citric Acid, Partially Hydrogenated Soybean Oil, Dehydrated Garlic, and Artificial Flavors. ), Modified Corn Starch, Soybean Oil, Salt, Sodium Phosphates.